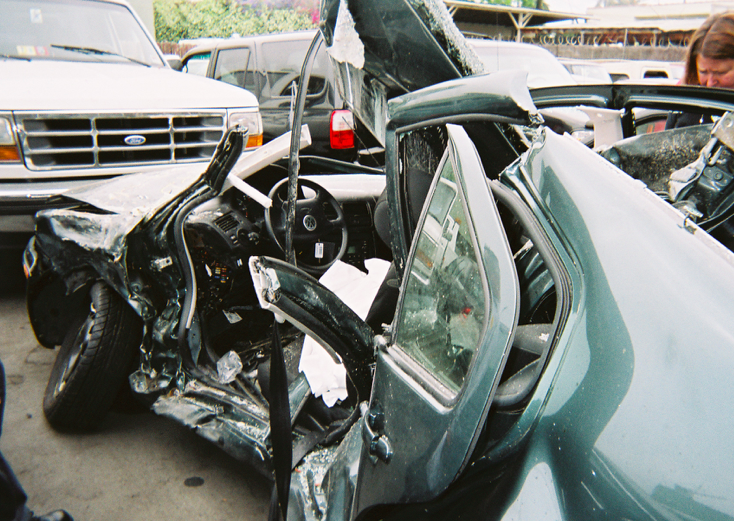 Photos above show car wreckage and Tina's x-ray of during swallow test. Tina is a 47-year-old car accident survivor with traumatic brain injury (3 on the Glasgow Coma Scale) who has been quadriplegic for over 12 years. 1. Tina has eliminated her hyperbaric chamber dives. 2. Tina has eliminated her home visit physical therapy sessions. 3. Tina has rapidly improved her wound healing so the home health care nurse visits every other day, not every day like before. 4. She sleeps 8 hours through the night instead of waking up hourly as she always had to benefit her and her 24/7 care givers. 5. She feels warm now throughout the day. Previously she always felt cold. 6. Her spasmodic episodes are significantly reduced and her pain and discomfort levels are reduced. 7. She can do KAATSU full body pandiculations (stretches). This has enabled her body to begin less stiff and more flexible and easier to carry and move. This greatly benefits her 24/7 care givers and helps reduce the pain they feel in their own backs and shoulders. 8. She can move her feet and stretch her legs. 9. She can move her arms and is working towards feeding herself and using an icing bag to decorate cakes (her previous profession). 10. She looks forward to sharing her story with others in similar situations. Linda learned about KAATSU after watching Tap Nixon, a 74-year-old man, improve with KAATSU Cycle. For the past 12 years Delmar has been on the side of her younger sister, Tina, in the hospital, care facilities and finally home. A hit-and-run accident left Tina a quadriplegic when she was 35 years old [see wreck above]. Tina, a 47-year-old cake designer and decorator, survived a car accident in 2006 [3 on the Glasgow Coma Scale]. Linda explained that Tina experienced “internal decapitation” (medically known as an atlanto-occipital dislocation; atlas is the name of the topmost vertebral bone of the spine; the occipital bone forms the lower part of the back of the skull). During the first six years after the accident, Tina lived in care facilities and breathed through a ventilator and tracheostomy tube. For the past six years, she has lived at home with Linda with 24/7 caregivers and therapists at her side 365 days a year. Tina is mentally alert, very attentive, laughs, smiles, acknowledges conversations around her with expressive eyes. She speaks very softly. After a KAATSU demonstration by the KAATSU Specialist, Linda became excited to try KAATSU Cycle on her own arms to see how it would feel on her sister. The KAATSU Specialist applied one KAATSU Air Band on her arms that quickly became pink with the resultant blood engorgement. Linda started to move in an easy, rhythmic manner as she is a hula dancer. After a few minutes, Linda stated that she was feeling the burn and started sweating as if she was working out harder than she was. Tina listened intently to the explanation and carefully observed the demonstration. The KAATSU Specialist asked Tina if she wanted to try. She said yes with a sparkle in her eye. Linda was asked if she could put the bands on Tina, but Tina said, “No...you” with her eyes focused on the KAATSU Specialist. The KAATSU Specialist placed a pink band on her right arm, her good arm that was less spastic than her left arm. Both hands remained in the clenched position and angled towards her torso. The pink band was placed with a very, very light Base SKU (under 10 SKU). Tina confirmed that she felt comfortable with the band on her upper arm. Tina had previously mentioned that she wanted improved muscle tone. The KAATSU Cycle mode was selected and an Optimal SKU pressure of 100 was selected (on the scale of 0-400 SKU on the KAATSU Nano device). Within seconds of the air being compressed into the pink band, Tina's skin tone almost immediately became a light pink color, obviously a shade darker than her normal skin tone. Her eyes glistened as she concurrently focused on the additional pressure she felt on her arms. She proceeded to 3 KAATSU Cycles (3 minutes 20 seconds per Cycle): the first at 100 SKU, the second at 120 SKU, the third at 140 SKU as she verbally confirmed her consent. The band was then removed after the 10 minutes of KAATSU. The KAATSU Specialist asked her to try and move her hand. She was able to ever so slightly move her right hand. Linda and Yuri, her caregiver, appeared to be pleasantly surprised. She was asked to attempt moving her right hand again. She moved her hand again with a slightly greater range of motion on the second attempt, but these movements clearly required significant effort and concentration on her part. Linda took videos of the session as Tina and the KAATSU Specialist were focused and constantly sharing feedback about the sensations she felt, the resultant movements and skin color. It would have a great opportunity to place a Masimo MightySat Finger Pulse Oximeter on her finger to check her physiological data on the next-generation KAATSU Master 2.0, but her hands were constantly clenched in a spastic paralysis. Then Tina said, “I feel warm” as her arm remained a slightly pink color. The session ended as Tina agreed to meet the following day. The KAATSU Specialist Steven Munatones remarked on what he just observed, "I felt all the years of listening and learning from [KAATSU inventor] Dr. Sato were all worth the effort - even for this one spectacular moment in a bedroom in Long Beach, California with a car accident and Traumatic Brain Injury survivor, her sister and her caregiver." Yuri, the caregiver, said Tina slept very well - and snored loudly - after the KAATSU session on the previous day. This morning, she did not feel sore and felt good. Tina was excited and at considerable ease on the second day. Caregiver Yuri placed two pink KAATSU Air Bands on her left and right arms. Tina agreed as the goal is to get the entire network of family members, therapists and caregivers certified as KAATSU Specialists so they are very confident and competent in applying and doing KAATSU by themselves. Tina did 4 KAATSU Cycles at increasing Optimal SKU levels on both arms, starting at 100 SKU (i.e., 100 SKU on the first Cycle, 110 SKU on the second Cycle, 120 on the third Cycle, 140 SKU on the fourth Cycle). Her Base SKU was still low (i.e., under 10 SKU). By the second KAATSU Cycle, both her arms had achieved a pink color, including around the scar tissue that is around a very long scar on her upper arm. Linda said, “I have never seen her scar get pink." On the third KAATSU Cycle, Tina independently tried to move her hands. She concentrated deeply, squinted her eyes, and moved both hands at approximately 45°. Everyone smiled. Then, without prompting, Tina started to move her left arm. She closed her eyes and with a furrowed brow, she held her breath. Unbelievably, she did a complete bicep curl. Linda was shocked and said, “In 12 years I have never seen her move her left arm straight up and as far as that. If she tries to move her left arm it takes tremendous effort and I can see her “thinking” about trying to move it. Before this moment, she has had to essentially move her whole right side to get a little movement from the left. Her brain stem injury precludes her from moving without ‘thinking about it’ as we do. Again, Tina closed her eyes and her entire body shook as she attempted to move her left arm again. She was literally willing her arm up again as she held her breath. When she completed her second arm curl, it was clear that she was physically spent. She gave it everything she could as her body seemed to sink into her bed. She finished her upper body workout with one more KAATSU Cycle. Then the arm bands were removed. Yuri took Tina’s right hand and easily opened her fingers. Yuri had tried to open her clenched hand on Day One, but Tina did not want to do it because it hurt. Tina was beaming with pride - and exhaustion - as she smiled in a supine position on her bed. Yuri put the KAATSU Air Bands on her right leg with a very low Base SKU. Her left leg has a bacteria infection and bandage so it was decided to only focus on her right leg. The KAATSU Cycle mode was changed to LEG with an Optimal SKU of 100. Tina proceeded to 3 KAATSU Cycles at that pressure. After the third KAATSU Cycle on her right leg, the band was removed. This time, Linda asked Tina if she could move her legs. She turned her feet very slightly inward, perhaps 5-10°. “Wow!” was the collective expression as everyone smiled. Linda joked that Tina was really going to snore loudly on her post-KAATSU nap. KAATSU Master Specialist David Tawil of New York visited Tina for her third consecutive KAATSU session. But Tina just had experienced a total body spastic episode and was very uncomfortable. She also felt cold. Her caregiver had just finished giving her a massage, but it was clear that Tina was still in distress. David asked her if she wanted to do KAATSU. "I would not have been surprised if she declined," Tawil said later. But Tina wanted to do KAATSU and proceeded to do 4 KAATSU Cycles at 100 SKU + 110 SKU + 120 SKU + 120 SKU pressure on both her arms. 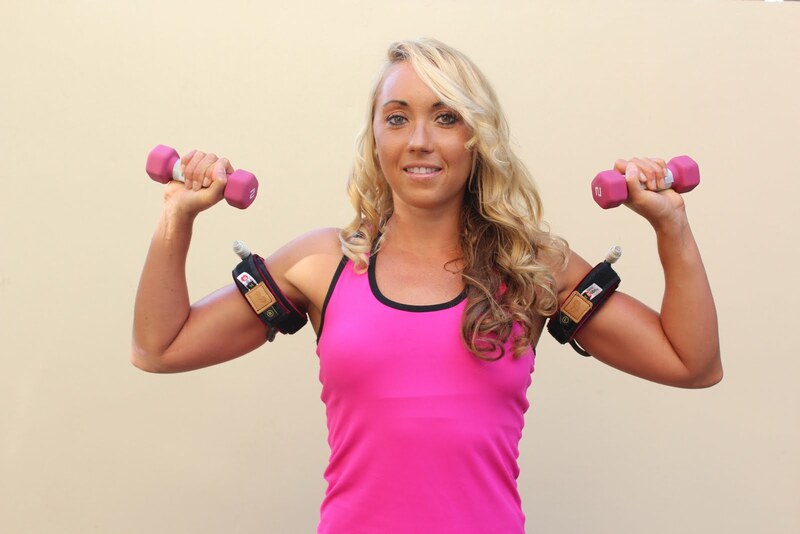 Without prompting, Tina suddenly did 10 consecutive biceps curls on her right arm as she moved her hands from near her waist upwards to her shoulders. She then focused on her weaker left arm and proceeded to do 6 consecutive biceps curls with her left arm in the supine position. Her improvement was remarkable the way she moved her arms and hands on her third KAATSU session of less than 15 minutes. Tina clearly put in a tremendous effort into each of these movements of her left and right arms. Tina then expressed an interest to eat for herself and then attempted to open her left hand by herself. She was not able to do anything but move very slightly one finger, but her attempt was admirable. A pink KAATSU Air Band was then placed on her right leg and 2 KAATSU Cycles were performed (20 seconds of applied pressure followed by 5 seconds of release repeated 16 times). She then proceeded to move her toes inward. Tina repeated her KAATSU session on both arms and her right leg...ready for the following week. "Our goal is to teach the standard KAATSU protocols to Tina’s sister Linda, her caregivers, and therapists over the next week so they all can work with Tina according to their own time schedules and availability - and comfort of their own home," said Munatones. "The convenience of KAATSU - to be able to do anywhere at anytime - is compelling." Tina repeated her KAATSU session on both arms and her right leg. Tina repeated her KAATSU session on both arms and her right leg. She used the new KAATSU Aqua Bands on her arms with a Base pressure of 10 SKU. She did four KAATSU Cycles at 100 SKU, 110 SKU, 140 SKU and 150 SKU. She did some arm contractions and biceps curls on her right arm while she was propped up in her bed. After her upper body workout was completed, Yuri placed a plastic fork in her right hand and she attempted to bring the utensil to her mouth. She got her hand holding the fork to approximately a 90° angle with considerable effort. She was also able to move her right shoulder for the first time. Yuri then placed the plastic fork in her left hand and she attempted to bring the utensil to her mouth. She got her hand holding the fork to approximately 45° with considerable effort while her body shook withe effort. She also felt warm and started to perspire due to her effort. Tina finished her workout with a standard KAATSU Air Band on her right leg with a Base pressure of 10 SKU. She did 4 KAATSU Cycles at 150 SKU, 160 SKU, 190 SKU, and 200 SKU. After the second and third Cycles, she asked for the pressure to be increased. Tina did 4 KAATSU Cycles on both her arms followed by 4 KAATSU Cycles on her right leg. She used a Base SKU level of 10 on both her arms and leg with Optimal SKU levels of 100 + 120 +140 + 150 respectively on her arms and Optimal SKU levels of 150 + 160 +180 + 200 respectively on her legs. She ended the session by giving a fist pump to the KAATSU Specialist [see above]. During these arm Cycles, a spoon was placed in her right hand and she attempted to raise the spoon to her mouth. Tina did 5 KAATSU Cycles on both her arms followed by 5 KAATSU Cycles on her right leg. She used a Base SKU level of 10 on both her arms and leg with Optimal SKU levels of 100 + 120 +140 + 150 + 150 respectively on her arms and Optimal SKU levels of 150 + 160 +180 + 200 + 200 respectively on her legs. During the last two arm Cycles, a spoon was placed in the professional cake decorator's right hand and she attempted to raise the spoon to her mouth. She had a lower back pain before the KAATSU session started in which she felt relief after her KAATSU session was over. Her sister and caregivers have been taught the standard KAATSU protocols and will conduct the KAATSU sessions by themselves over the weekend. 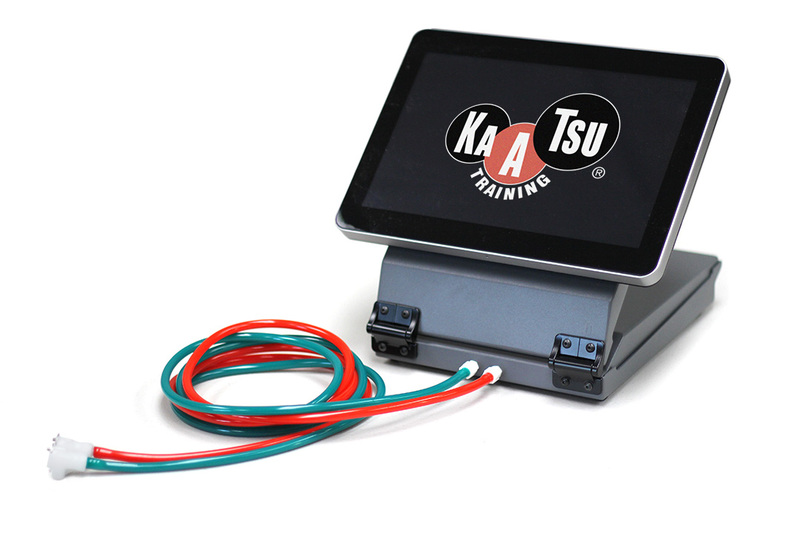 They will be given the opportunity to become certified KAATSU Specialists by taking the 100-question online certification examination. After doing 5 KAATSU Cycles between 100 - 170 SKU on her arms, Tina did calf and leg exercises and whole body pandiculation during KAATSU Cycles at a Base pressure of 10 SKU and Optimal pressure between 150-220 SKU on her legs. Her body continues to feel warm upon doing KAATSU Cycles. After doing 5 KAATSU Cycles between 100 - 170 SKU on her arms including biceps curls with a plastic spon, Tina did calf and leg exercises and whole body pandiculation during KAATSU Cycles at a Base pressure of 10 SKU and Optimal pressure between 150-220 SKU. Her body continues to feel warm upon doing KAATSU Cycles. Tina felt sore after her vigorous workout yesterday so we decided to go easy. Today was simply a recovery day using KAATSU Cycles without movement or exercises. After a recovery day on Day 16, Tina did 5 KAATSU Cycles on her arms (with an Optimal SKU of 100 + 120 + 140 + 160 + 180). Tina was able to put an icing bag in her right hand, squeeze it, and plans to soon start decorating a cake for the first time in 12 years. Q1. Why does a patient with paralysis become more relaxed and sleep better after doing KAATSU? A1. The sympathetic nervous system has been activated for a long time. When KAATSU is performed, the sympathetic nervous system relaxes as the parasympathetic nervous system is stimulated and patients with paralysis are able to sleep well [after KAATSU]. Also, mechanical stress - which is a good stress - occurs and they can sleep comfortably. Q2. 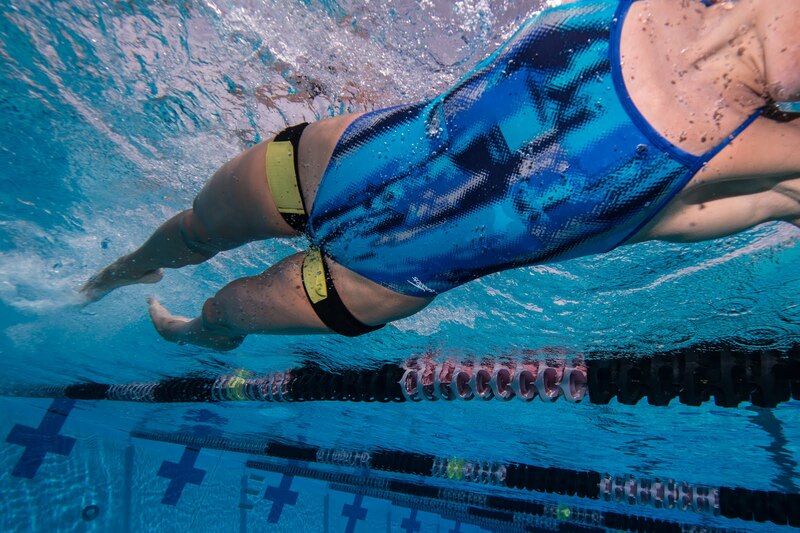 What is the mechanism that enables an increased passive range of motion in her elbows, hands, and ankles? A2. After the accident, joints became harden and spastic [for a long time, decades]. The tendons and ligaments become harden. Relaxed by KAATSU, because the sympathetic and parasympathetic nervous system are well activated, the joints and muscles become loosened. This increases its range of motion. There are tendons within the muscles, but they will not become soft soon. Over time, however, the tendons gradually softens over the course of many months. Q3. The muscle and ligament contractures in their elbows, wrists, fingers and ankle plantar flexors are rigid. Can you predict how much a patient with paralysis can improve her range of motion? A3. Patients with paralysis have been tense for a long time and their bodies became stiff as a result. It is very important to make concentrated efforts just like climbing stairs, step by step. They should not be impatient. Movement towards their goals might go in a good direction if they keep making steady effort. Q4. Why do quadriplegic patients feel less pain? A4. The pain is relieved because of the secretion of beta-endorphins, which is called intra-cerebral anesthesia in the brain. Also, the nerves of the muscle fibers that were in a sleeping state around the damaged muscle fibers are awakened by the application of KAATSU. Thus, the pain is relieved. Q5. There are some red spots that showed up on a quadriplegic’s right thigh after the initial session. Was the Base SKU too high initially? A5. You can judge that the patient's blood vessels are weak due to the appearance of red spots on the skin. Perhaps next time, when KAATSU is applied with the same SKU, these tiny red specks might disappear. Some people might say that KAATSU is dangerous because the red spots appeared or KAATSU might cause blood clots. The red spots indicates that stimulation was sufficiently given to blood vessels. It is important to start with KAATSU Cycle 1 (i.e., 100 SKU) for people who are trying KAATSU for the first time and gradually move on to KAATSU Cycle 2 (e.g., 120 SKU), Cycle 3 and on. Q6. Should we worry about blood clots in immobile patients? Does the potential for existing clots change KAATSU protocols? A6. The potential for kicking off blood clots will not change as long as you do the KAATSU Cycle. Start with pressurization for 30 seconds and depressurization for 5 seconds (i.e., KAATSU Cycle on and then off). Since the blood vessels gradually increase resistance against pressure and patient's blood vessels get used to SKU and can tolerate it. Do not worry about thrombosis. Q7. If patients eat poorly, what should we worry about with KAATSU? A7. Improving one’s diet in parallel with doing KAATSU is one kind of treatment. The three goals - exercise, good diet and sufficient sleep are important to become healthier. It is necessary to balance these three factors. Q8. Do you recommend 2 full cycles, 2 times a day? What do you recommend for daily KAATSU usage? A8. The daily usage of KAATSU varies according to patient's abilities and their level of physical fitness. In the case of patients where spasticity tends to easily occur, even if their body loosens after one KAATSU session, it is possible that they will return to their original state after a few minutes. 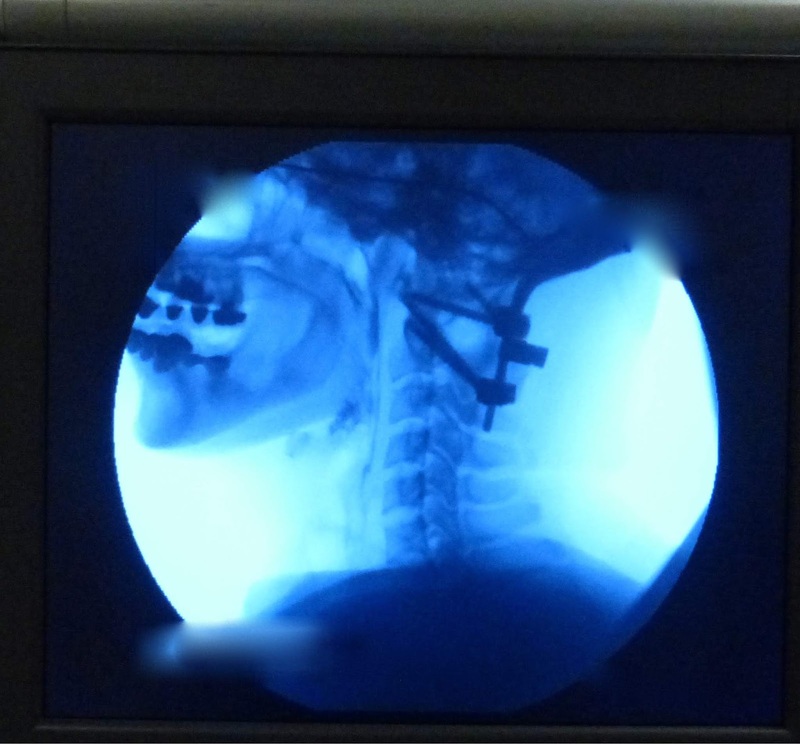 Rather than deciding whether to do one or two KAATSU Cycles, the amount of KAATSU should be decided by the patient. Generally, the more serious the patient, the more times they should do the KAATSU Cycle. Conversely, for less serious patients, the less time should be spent doing KAATSU. That is, the number of times doing KAATSU Cycles should be decided on a case-by-case basis. Q9. Why do patients with spinal cord injuries feel warm during KAATSU - especially when they have no sensation in the same limb? A9. The fact that their body feels warm after KAATSU is evidence that new blood vessels were created. Normally, there is no medical treatment to create new blood vessels instantly, but KAATSU instantly creates new capillaries. Blood flows to those points in the body and their body warms up. Conversely, when the body is exposed to below the freezing temperatures, capillaries are pulled away and the body becomes cold. Q10. Why does KAATSU appear to help with neuropathic pain in spinal cord injury patients? A10. For not only the patients with spinal injuries, but also the patients with various diseases, when they do KAATSU, cells and muscle fibers that have not been used until now start to work. Consider the case if there are 100 soldiers, but only 10 of them have been working. When those 10 soldiers are injured, the 90 other soldiers will start working on behalf of those 10 people. Q11. The Masimo device measures Perfusion Index (an indication of the pulse strength at the sensor site). The Perfusion Index values range from 0.02% for very weak pulse to 20% for extremely strong pulse. Normally, the Perfusion Index decreases during KAATSU, but why does the Perfusion Index often increase during KAATSU for a client with a spinal cord injury? A11. KAATSU immediately creates new blood vessels and the blood fills the place where no blood was flowing until then. Naturally, the perfusion index will increase in this case. Q12. For spinal cord injury patients, Capillary Refill Time is often very slow with no KAATSU pressure, and speeds up during KAATSU. Why? A12. Since the blood flow reaches every corner [in the limb], Capillary Refill Time is accelerated. New blood vessels are increased. When you do KAATSU, VEGF (Vascular endothelial growth factor) new blood vessel growth factor hormone increases. KAATSU effects have continued to surprise me. Q13. If neural pathways are NOT intact (for example, with a completely severed spinal cord) for an individual with a spinal cord injury, why does the client still feel pain? Why does KAATSU appear to decrease that pain? A13. Blood vessels are not connected, but new blood vessels are born. It is the same as bypassing a road. Rather than repairing broken roads, roads are made new. When new blood vessels are formed, nerve cells comes after, and nerves are completed. As new blood vessels are formed, neural cells are formed. In a previous KAATSU trial, we put a patient’s head in a Functional MRI machine as we applied KAATSU to both arms while doing Hand Clenches with a grip band. New blood vessels increased in the portion of the brain that was black. Naturally, neurons are formed after. Since KAATSU works, I would like doctors and researchers at the VA to conduct further clinical trials. Q14. Many military therapists use electrical muscle stimulation on spinal cord injury patients. Can this Electrical Muscle Stimulation device be combined with KAATSU to achieve better results during the isometric contractions? A14. There are various devices such as electric stimulation units and EMS available now. When electric stimulation is given, the muscles shake. There are several research results that cause muscle hypertrophy to some extent. We get requests from researchers who specialize in electrical stimulation to simultaneously use KAATSU and electrical stimulation. We performed clinical trials on patients with spinal injury who could not move their legs. It showed positive results with KAATSU. "Your legs are stronger than life..." said New York Mets outfielder Yoenis Cespedes after a KAATSU leg workout with former Stanford University athletic great and current ESPN sports broadcaster Jessica Mendoza. Mendoza tried KAATSU training with Cespedes and Mike Barwis, a certified KAATSU Specialist and an early adopter of KAATSU, at the Barwis Methods Training Center in Port St Lucie, Florida in 2017. Please note that heavy weights with KAATSU is not part of the standard KAATSU protocols. 74-year-old Tap Nixon, a former basketball player, hurt his left shoulder, has had 3 hip surgeries, and has long used a cane to help him limp along. After 8 KAATSU sessions, he can now pass and shoot a basketball - and open a Gatorade bottle - which he could not do before. Tap warmed up for his basketball moves with some KAATSU Cycles on his upper body (30 SKU Base Pressure + 290 SKU Optimal Pressure) and some KAATSU Walking with 35 SKU Base Pressure + 320 SKU Optimal Pressure on his legs. For his full progression over these last 3 weeks, visit here. For an explanation on what is happening physiologically, click here.